CLICK AND BUY A TESLA by Jim Corbran, Automotive Columnist So there I am, passing time on the internet, when I cruise on over to the Tesla web page. Now, most automobile manufacturers have a button to click to “build your own,” where you get to choose colors, options, etc. and afterwards see what it will cost and look like. Tesla’s page, under the Model S sedan heading, has a button which says “order your Model S.” Being in the Christmas spirit, and feeling rather generous, I decided to do just that. Clicking on the button took me to a page with options. I can pick from among three different powertrains, the standard 70 kWh battery with a 240-mile range, 5.2-second zero-to-60 time, and 140 mph top speed. A maximum range option changes those numbers to 85 kWh, 270 mi. 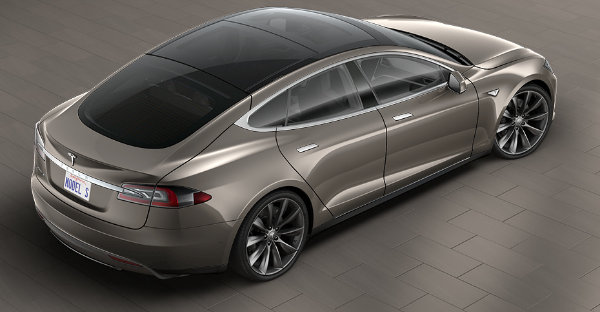 range, and 4.2 0-60 and top speed of 155, while the maximum performance option has the same 85 kWh battery with a 253 mi. range, 0-60 in 3.1 secs., and a 153 mph top speed (a 90 kWh upgrade will add about 6% more range and shave .3 seconds off the 0-60 time). You can also choose all- or rear-wheel-drive, and there are a number of comfort/convenience packages to choose from (including putting two rear-facing child seats in the hatch area). Feeling generous is one thing; being thrifty is another, which is what I decided to go with before hitting the “order” button. Standard range, rear-wheel drive, grey turbine wheels and a glass roof — $82,000 + $1,200 destination & doc fee. They’re telling me I will have a late December delivery. I like it. My build is in the photo above. Let’s hit “order….” Of course they want my name and address, email & telephone number, and whether I’m paying cash or leasing. Oh, and they want to know if I have a trade-in. How’s a 1998 Mazda Protegé with 164,000 mile sound to you? Let me get out my Kelley Blue Book, Lol. Whoops, now they want my Visa card info, or I can just click PayPal. Hmm, I think we’ve just hit a wall. If you have a larger credit limit than I do, why not get yourself over to the Tesla website today and order yourself up a Model S? I’ll only ask to borrow it on weekends and holidays. See more here: Tesla Model S ### The post CLICK AND BUY A TESLA appeared first on Buffalo Cars.